Students were evacuated by police from Marjory Stoneman Douglas High School in Parkland, Fla., after a shooter opened fire on the campus. 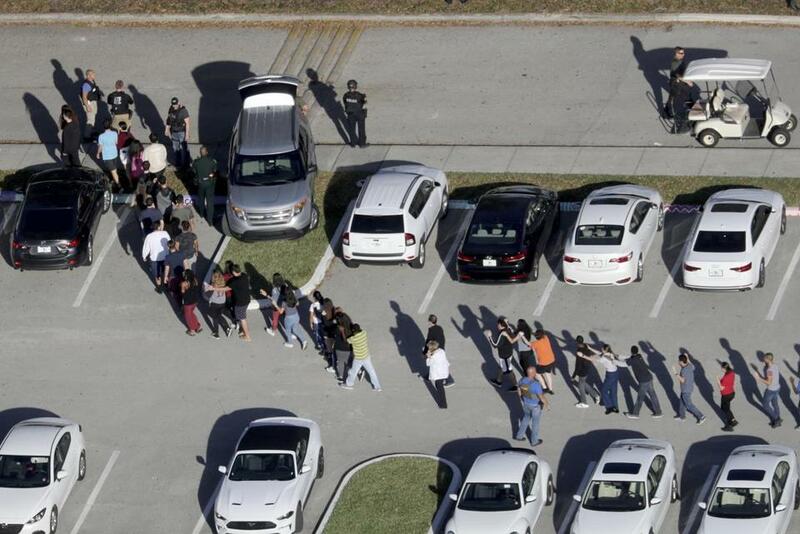 MIAMI — In the first chaotic moments after a gunman opened fire at Marjory Stoneman Douglas High School in Parkland, Florida, more than 70 people called 911 desperate for help, including at least one boy who telephoned from inside the school and whispered urgently to an emergency dispatcher. “Someone’s shooting up the school at Douglas,” he said, according to an audio recording of the call released Thursday by the sheriff’s office in Broward County. The office released recordings of 10 calls that sometimes depict panicked parents furiously texting their children at the school and relaying information to law enforcement. One father put his daughter on speaker phone and repeated what she said to the 911 operator. The recordings, a fraction of the evidence that authorities have been poring through since the Feb. 14 rampage, showed the uncertainty, fear and conflicting information in the minutes after officials believe the gunman opened fire. The suspect, Nikolas Cruz, 19, a former Stoneman Douglas High student, is accused of killing 17 students and school employees in about six minutes. Separately on Thursday, Cruz, who was indicted this week, withdrew his not guilty plea. In a one-page filing in Circuit Court in Broward County, Cruz’s lawyers said he would stand mute. Under Florida’s court procedures, the decision has the effect of a not guilty plea, but it may help insulate Cruz and his defense lawyers from perceptions that they are contesting his culpability in crimes to which he has confessed. In an effort to stave off a trial that could lead to his execution, Cruz has offered to plead guilty in exchange for a sentence of life in prison without the possibility of parole. The 911 calls came into the sheriff’s office through a regional county system. The first police officers to respond to the shooting came from the city of Coral Springs, which is near the school and operates its own, separate call system. Using the adults as intermediaries, the recordings revealed, county dispatchers tried to gather information and make recommendations about how the students could shelter inside the school. Only one of the recordings was of a call from inside the school — the one from the unidentified boy, who was speaking too softly for the dispatcher to hear him clearly. “Somebody is shooting up Stoneman Douglas,” he said. The dispatcher still could not hear. “Marjory Stoneman Douglas High School is getting shot up,” he repeated. In the call with the father who put his daughter on speaker phone, his wife could be overheard talking with their daughter, who was in Room 1214 of the freshman building. The parents of another girl, who was in Room 1213, texted their daughter back and forth to give the dispatcher information, according to another recording. At one point, the girl’s mother began watching television coverage of the attack while on the phone with the dispatcher. Eventually, after minutes of confusion and uncertainty, the police arrived to Room 1213. Three people had been shot.